Sam and I decided to forgo the usual exchange of christmas presents and put the money we would spend towards something useful. In the black friday sales we went all out on some juicing equipment from Vigo Press. We bought a Classic Crusher A, a 20 litre press and a stainless steel pasturiser. Just before Christmas we decided to try it out. We gathered the last of the apples from the trees, eating and cooking and gave it a go. We had about 20kg of apples and set up a little production line. 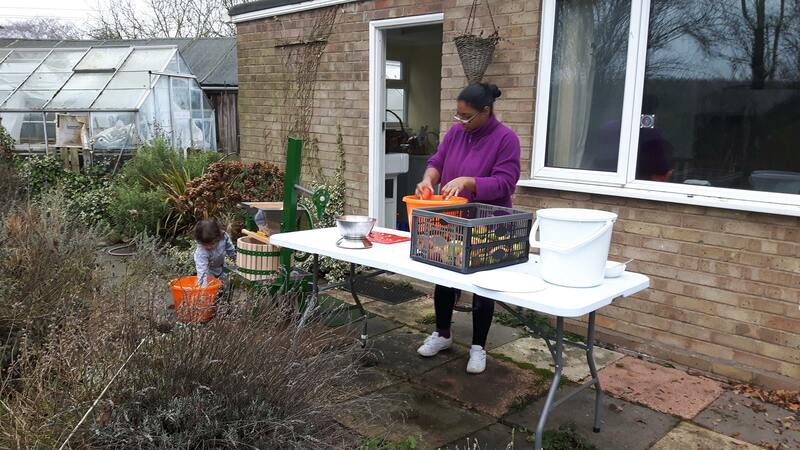 We gave the apples a quick rinse in a tub of water, quartered them (cutting away and bruised or bad bits) and put them in the crusher. We ran them through that once, in batches of 10kg, the crusher was really easy to use, so easy a child could do it. 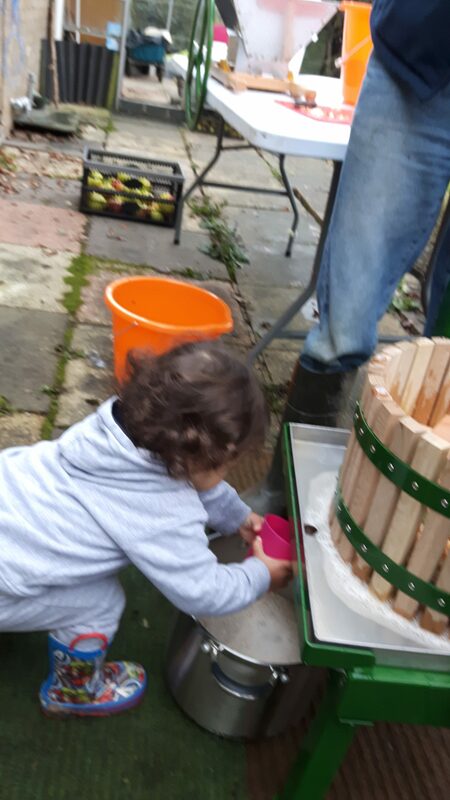 Chi had a great time putting the apples in and even turning the crusher. We then used the press, that was a bit more complicated. We didn’t secure the press and I think that next time we will bolt it to a pallet or something. We ended up having to have one person hold it whilst the other wound it to press the fruit. I didn’t get any pictures of this step though, I will do next time. We had a stainless steel pot underneath to collect the juice. Chi was very happy to have a taste of the juice fresh from the press! We added some citric acid in the hope that it would stop browning. It didn’t, after talking to the staff at Vigo Press they suggested using ascorbic acid at 0.5g/litre, I think we will try that next time. We didn’t end up with as much juice as I had hoped for, about 8 750ml bottles. Again Vigo Press advised that we could try running the apples through the crusher twice and we shall definately be trying that next time. 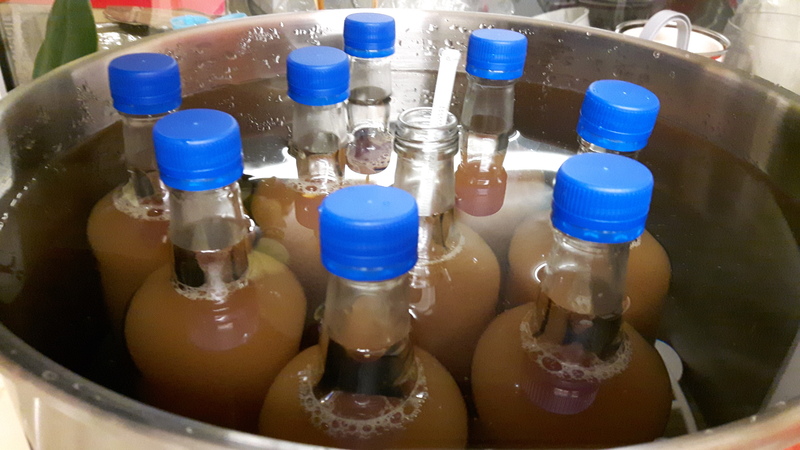 The pressed apples weren’t as dry as I had been expecting them to be so I think we could have gotten more liquid from them. They did make a nice treat for the geese and chickens though. We pasturised the juice and I was very happy to see that it did lighten in colour, so it wasn’t so brown. The only issue we had was that some scum appeared at the neck of the bottle. We might get less of this if we use a mesh bag in the press to stop bits and pieces coming through. But Vigo Press suggested leaving in a sealed container overnight and then pasturising, so that’s another option. 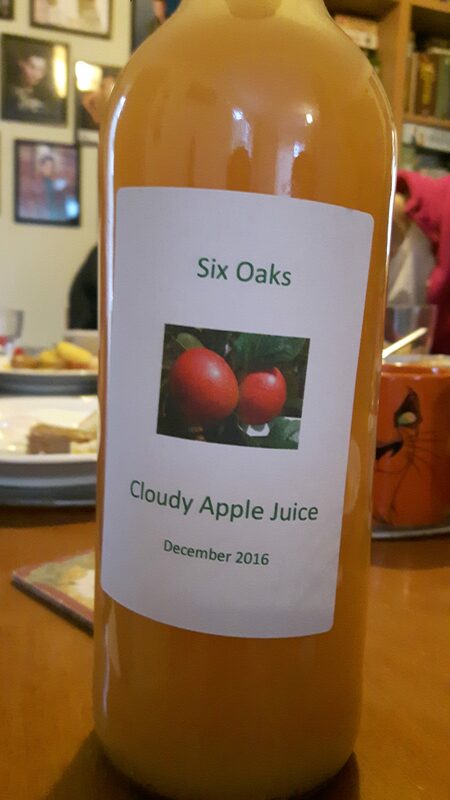 The juice tasted really nice, and although we only got 8 bottles we are managing to save them for special occassions. I am really looking forward to 2017, we will keep more apples this year as I had been getting rid of any with even small blemishes. I can see some nice family days pressing apples, it’s a great family activity. And I’m looking forward to trying it with pears and with trying to make some wine with the juices. Yep, very excited to get more use out of this equipment! Great result for your first time! Glad to hear that is useful. We were thinking of getting the smaller press but we liked the idea of sitting the crusher ontop of the press, and that did make things simpler. I also don’t think we would want larger for our level. We have 3 cooking apple trees and 5 eating apple trees, so should get plenty of apples, but the 10kg loads are about our limit for lifting around.